You are currently browsing the tag archive for the ‘The Cave’ tag. I went to a preview of Danny Boyle’s 28 Days Later at the Dublin Horrorthon, for Halloween 2002. As the producers were trying to build up positive word of mouth for this pseudo-zombie pic – and it is instructive to remember that the current horror glut had not yet washed up on the shores of the mainstream – the screening I attended was followed by a Q&A session featuring the director and stars Cillian Murphy and Naomie Harris. One member of the audience commented that the film reminded her of a novel by José Saramago. I had never heard of the book before, so this proved to be my introduction to the Portuguese author. The novel Blindness does have broad similarities to Boyle’s film. A mysterious ailment causes the collapse of society, although in Saramago’s tale marauding zombies are not the cause, with the entire population of an unnamed country suddenly losing their sight. The novel has a sequel of sorts in Seeing, a political satire that is essential reading and not dependent on the previous book, although it does reveal the fate of the previous book’s protagonists. Today’s book is once again a satire of sorts predicated on a surreal hook. Cipriano Algo is a potter whose business is dependent on the nearby monolithic Centre, a commercial/residential complex. Living in the shadow of the Centre, not only is Cipriano just barely making enough money from selling clay pottery to its residents, he is legally forbidden from selling his wares to anyone else. The small business is run by Cipriano and his daughter Marta, whose husband Marçal enjoys an uneasy relationship with his father-in-law. Partly this is due to the young couple intending to move to the Centre, where Marçal works as a security guard. Cipriano resents that his daughter will eventually be pulled away from him by the Centre. Disaster strikes when his goods are finally rejected by the head of the buying department, with insult added to injury by the order to remove the surplus stock of clay crockery from storage. Desperate to attempt to stay in business, Cipriano and Marta attempt to innovate by producing clay figurines instead. The Centre agrees to accept an initial order on a provisional basis, with the buying department head secretly enjoying the philosophical badinage he engages in with the quick-witted, but humble potter. Another addition is made to the small family by the arrival of a dog, named Found by Cipriano, who inserts himself into the lives of the struggling artisans. Meanwhile Marçal feels increasingly pressurized to achieve a promotion so he can earn the right to live in the Centre with Marta and Cipriano discovers a second chance at love with the widow Isaura. Once again Saramago delivers an amazing combination of political satire, absurdism and philosophical inquiry. The callousness of the Centre towards desperate labourers such as Cipriano is masked by false niceties, symbolizing the double-edged sword of consumer culture. Issues of family loyalty are also dealt with, as Marçal finds himself goaded by his resentful father-in-law on one side and then being criticized sharply by his own parents for not agreeing to allow them to live with him in his promised future apartment in the Centre. Saramago also in a wonderful feint introduces us to the thought processes of the dog Found and its gratitude to the Algo family for taking him into their home. Beneath all of the above, we also have several allusions to Plato’s parable about the Cave and the nature of reality. 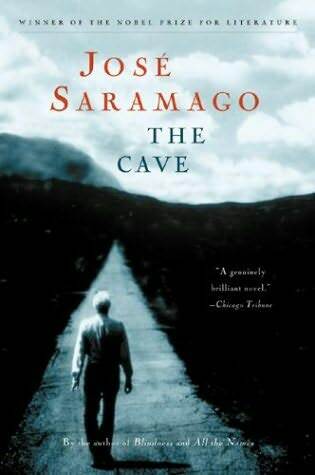 Saramago, I feel, was one of the most incredible literary stylists of the late twentieth century. Sadly the author passed away recently, but he was always fearless in describing thoughts and ideas that proved too controversial for his Catholic homeland. Reading his pages can sometimes feel like staring at a morass of words, with run-on sentences and absent punctuation increasing the feeling of alientation. Should the reader persevere, however, a natural flow to the language Saramago uses emerges, almost like poetry. An incredible book, by an incredible literary visionary. Need I say it is strongly recommended? I thought not.